We’d love your help. Let us know what’s wrong with this preview of ...Who Needs Enemies? by Alan Dean Foster. 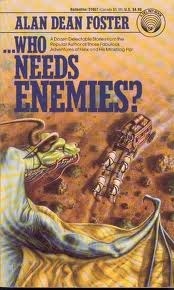 To ask other readers questions about ...Who Needs Enemies?, please sign up. Be the first to ask a question about ...Who Needs Enemies? Mostly long-winded, actually. Clever ideas that could have been presented in 1/2 the words. As I neared the end of (most of) each story I remembered that I'd read it before, and when I finished the book I decided that I somehow must have read the whole book before. So, iow, mostly they're pretty forgettable, too. Well, this time it is definitely coming off my shelves and going out to the wide world. Author Alan Dean Foster (b. 1946) is a noted science fiction and fantasy author with such series as “The Humanx Commonwealth Series” and “Dinotopia Universe” under his belt. He’s also written several “Star Wars” and “Star Trek” books. The present book is a collection of 12 short stories of science fiction and fantasy with settings as varied as the swamp planet of Myra II to Somalia and to Colorado of the Old West. At his best, Foster writes with a sense of humor and irony. In some of the stories, Author Alan Dean Foster (b. 1946) is a noted science fiction and fantasy author with such series as “The Humanx Commonwealth Series” and “Dinotopia Universe” under his belt. He’s also written several “Star Wars” and “Star Trek” books. The present book is a collection of 12 short stories of science fiction and fantasy with settings as varied as the swamp planet of Myra II to Somalia and to Colorado of the Old West. At his best, Foster writes with a sense of humor and irony. In some of the stories, a sense of wonder creeps in. Overall, these are optimistic in outlook. The story that is perhaps the most fun is “Swamp Planet Christmas” told in a series of communiques between the commanding officer of the colonial services on a planetary outpost and headquarters on Terra on the subject of aboriginal conflict. Sounds dry? Only until the captain’s daughter figures out how to use the computer. Another story, “Snake Eyes,” is part of the author’s Flinx and Pip series. What would cause the minidrag Pip to leave Flinx’s side? She seldom does, so it must be of importance. While there’s a lot here to recommend it, I found it to be one of the less satisfying stories. I really enjoyed this collection. It's all great stuff. The title track (if you will) is awesome. Why Johnny Cant Speed is great too. Pericles from Dream Done Green is one of my all time favorite characters. So read this one already! Read and bought it along with 'With Friends Like These', but ended up reading only the few stories I liked. Entertaining compilation of stories from Foster...I especially liked Gift of a Useless Man and Wu-Ling's Folly. This wasn't a bad book. It's a book of several short stories. I have never read a pip and flinx adventure and his short story was my first. I liked them.